Jeep's Twitter feed has been hijacked. The company's account was taken over on Tuesday afternoon by what appeared to be the same hacker -- or hackers -- responsible for Monday's takeover of Burger King's Twitter feed. On Monday, the hackers posted a McDonald's (MCD) logo onBurger King (BKW)g's feed and claimed the chain had been sold to its golden-arched competitor. Jeep spokesman Todd Goyer said in an email: "We're aware of the issue and are working to resolve it as quickly as possible," . As for General Motors (GM)-owned Cadillac, the company tweeted "Just to clarify, Cadillac is not connected to the hack of the @Jeep Twitter account." 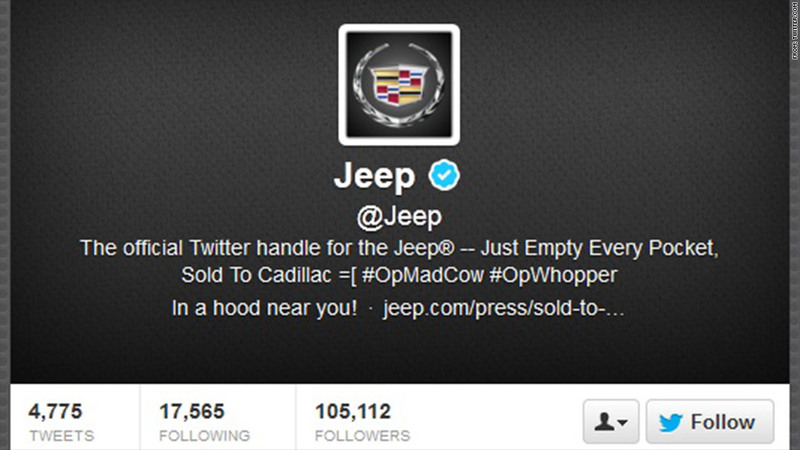 "First Burger King, now @Jeep has been hacked," Twitter user @johnnyteater wrote Tuesday. "Glad people have so much pointless time on their hands."